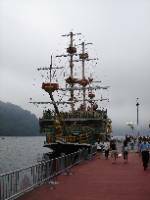 Blog from Hakone, Japan | What have we Dunn today?! Worry no more blog fans as we have returned to civilisation rejuvinated and ready to blog again! Our arrival in Tokyo has heralded a new dawn in technology, but more on that in the next blog! Our day in Hakone was yet another one to classify in the memory as 'interesting'! As a picturesque area set in the hills around a lake and overlooking Mt Fuji (or the bigfoot as he became known as you will soon appreciate) today was always going to be a relaxing one... or so we hoped! Our journey went really well until the gateway to the region Hakone Yumoto where we were due to drop our bags so we could explore the area before collecting them en-route to the hotel. Easy you'd think as every station here has lockers for this very purpose..
After following signs for the lockers of this particular station in the baking heat for 10 mins, we were led to a subway crossing for a road (you know the kind they use to mug people in in London?!) where the road must have been 40 feet deep as the steps down into the abyss looked endless.. Carrying our now approximately 60kgs on my back, I hauled the luggage to the bottom and back up the other side just before blacking out (again only figuratively for the mothers!) to see the hallowed coin locker sign. Excellent, I thought. IF YOU WERE WANTING TO STORE A COUPLE OF GOLF BALLS FOR THE DAY!!! The smallest lockers I have seen.. Honestly, you get bigger ones in the Johnstone baths! RAGING was an understatement! We ended up getting a taxi to our Ryokan to prevent any further frustration and went upon our merry way once more.. In Hakone, there is local route of 5 methods of transport which are designed to excite the train enthusiast and also let you see Mt Fuji and the surrounding attractions in a variety of ways. How quaint, and on a nice clear day they are amazing. On 16 July 2008 they were not quite up to scratch! Journey 1 on a train took us up to a funicular railway which in turn took us to a cable car. 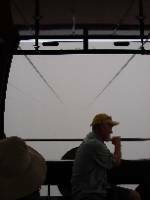 A few puffs of mist got in the way, but nothing to worry about.. Then the cable car had it's laugh. Around 2 yards from the start of this mode of transport we hit a wall of fog thicker than my Mum's carrot and corriander soup and saw nothing for the next 30 minutes! As the next leg of the trip took place on a Spanish Galleon (REWIND: Yes, I did say a Spanish Galleon. Not a clue why!) across Lake Ashai and offered the best views of the mountain we had our fingers crossed for a good view from there. We were again disappointed as there was sadly no let up in the weather. We did however get to see some fog, which was nice..
After a bus journey back to the Ryokan, our day was over but at the same time just beginning! 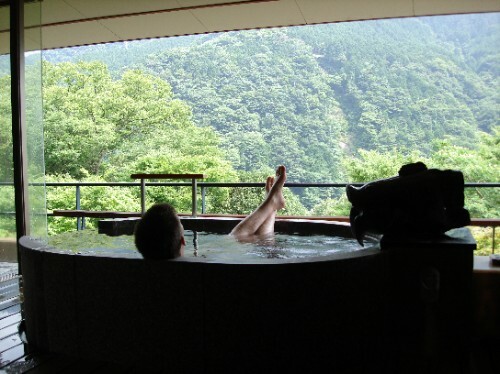 Ryokan are traditional inns which are typically set around hot springs and which have very strict rules of how the guest is expected to behave. We broke most of them! (Unintentionally of course..) We were led to our room and changed into our pyjamas which had to be worn around the hotel (I jest you not - see photos!). After a complementary thimble-full of beer we awaited dinner which would be served in our room... Nice..! AYE RIGHT! To start with: pike, octupus, eel and turtle amongst other things. To follow: (shortened list here..) sea cucumber, fish soup, sea urchin, dried small fish. For desert: Bean curd and blueberries. Well I'm stuffed just thinking about it again.. SHOCKEROONEY!